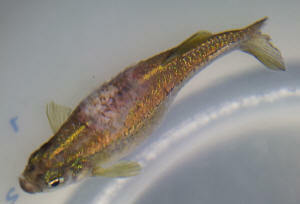 my Odessa barb population has stabilised well after I euthanised the swollen female. I've now ten Odessas swarming around my 180 litre tank, a lovely species, curious and outgoing. They are probably 4 months old, the males have not yet developed very strong red stripes. Three weeks after the latest Odessa health problem I thought it safe to add four young Red Swordtails to the tank. I now worry I might have been rushing it, and there's some problem left in the tank. The swordtails, one male and three females, are all swimming around, eating well and generally appearing in good spirit, but two of the females have developed a gray/white discolouration on the head (right between the eyes on the top side). Possibly a little fungus-like in texture, kind of rough. Hard to tell but I think it's slowly getting worse. The smallest of them has also become paler in colour, and her fins are a wee bit frayed. She is eating and swimming around, but stays near the bottom if she's not up chasing food. The male and the biggest female appear totally healthy. Have not seen any aggressive behaviour. I upgraded to my Rio 180 mid-September, used the water and gravel from my old 60 l, had a Nitrite spike the first week. Added the Odessas about three weeks later, after the Nitrite had settled at 0. My current water parameters are 25ÂºC, pH 8, GH 180, KH 240, Ammonia 0, Nitrite 0, Nitrate consistently 40. Doing weekly 30% water changes, adding JBL Ferropol plant fertiliser and a little aquarium salt. 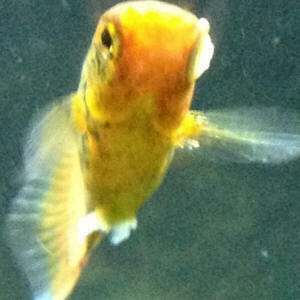 What could be wrong with my Swordtails? Could there be some residual problem left from my first batch of six Odessas (four of which died with swollen stomachs) -- some parasite, fungal or bacterial problem? Any tips on treatment of the Swordtails? Also, why isn't my Nitrate value coming down? I've cut my feedings down to once a day six days a week. Have got 1350 l/h filtration. Is my tank overstocked (2 x Elliotis, 10 x Juvenile Odessas, 4 x juvenile swordtails, 2 x bumblebee gobies, 1 x Bristlenose Pleco)? Have bought some API StressCoat, not sure whether to use it. As always, many thanks for your care and help! I have started a course of eSHa2000 now. Will keep a close eye on those Swordtails. Will be more patient next time I re-stock after disease, I just got too impatient! Checked my tap water for Nitrates too, it's showing 25 mg/l, consistent with the report I got from my local council. So at least I know it's never going to go below that as you so rightly pointed out. I have a jellybean parrot fish that is about 7 years old. It has recently developed white bumps/spots on its head. My husband thought the change in her appearance was due to age and so he dismissed it. He thinks he first noticed them about a week ago. I've attached two photos. The large bump in the center of her head is actually a cluster of bumps. It is white on the surface and somewhat fluffy in appearance with a red coloring underneath. As I'm hoping you can see in the photo, it is a protruding growth. There is a line of smaller white spots along the back of her head. The top of the fin on the left side of the second photo also appears to be abnormal in shape/color. The pale areas of the body are her normal coloring. She is eating and behaving normally. She is in a 55 gal tank with a rainbow, a catfish (I don't remember what breed) and several tetras. The last water change was 5 days ago and may have been a little overdue but not much. We do not have a quality test kit, only the simple strips. The water had not been tested in a long time and when I tested tonight the levels were not good. The nitrate level was 80, nitrite 3, pH 7.2, alkalinity 80 and the water was hard 150. My husband is doing a 25% water change now. The temperature of the tank is 76 degrees. I've tried to research the problem online but have only become more confused. I do not want to treat her for the wrong thing and cause more problems. I'd greatly appreciate your opinions. < Your cichlid has Hole-In-The-Head Disease. First get a nitrate test kit. My sister in law, who is an haematologist would have jumped with delight at the prospect of an autopsy but she is away now, where is family when you need them? Anyway, body is gone, so unfortunately no luck here. Sorry, I agree it would have been an interesting thing to do to rule out the poisoning. I was not sure about what you mentioned about EPA standard so I researched and I have found out that this is a US government guideline. I live in the UK and here these things are, to an extent, up to the local councils. Looks like the government regulations state the following with regard to nitrates "that the water satisfies the formula [nitrate]/50 + [nitrite]/3 1, where the square brackets signify the concentrations in mg/1 for nitrate (NO3) and nitrite (NO2)." Thames Water, the water company states 50 mg/l as standard. See link, if at all interested. My results came up as 40 but it might be an inaccuracy in the testing. Ph for the area in average is 7.5. In my tests it comes up as 8.00. Again, the differences might be coming from the testing process. I use API master kit. Maybe you have got better drinking water in the US. Funnily enough the report concludes that the quality of the drinking water is very good although there is one infringement as Coliform bacteria was found. do you realise I am giving this to my family to drink? From tomorrow onwards, bottled water for everyone. Anyway, I am keeping the tank cycled but empty for a couple of weeks to kill any potential nastiness and then I am not sure what to do. This tank is only 20 l (about 5 gallons) so, really only suitable for Bettas, too small for other species, but if the water hardness is going to kill them little beauties I would have to reconsider... Any ideas of what to keep in 20 l of hard water :-? What would you use to disinfect the siphon and the nets? The shop told me to wash them with hot water but that does not sound radical enough, somehow. Thanks so much again for your attention to this case.